Walking Dead Season 6 Finale Is Too Dark and Shocking? There are just four episodes left of The Walking Dead's sixth season, which many fans are starting to dread. We know that the season finale episode, Something to Fear, will introduce us to Negan, played by Jeffrey Dean Morgan, and his introduction in the comics lead to the death of a beloved character. 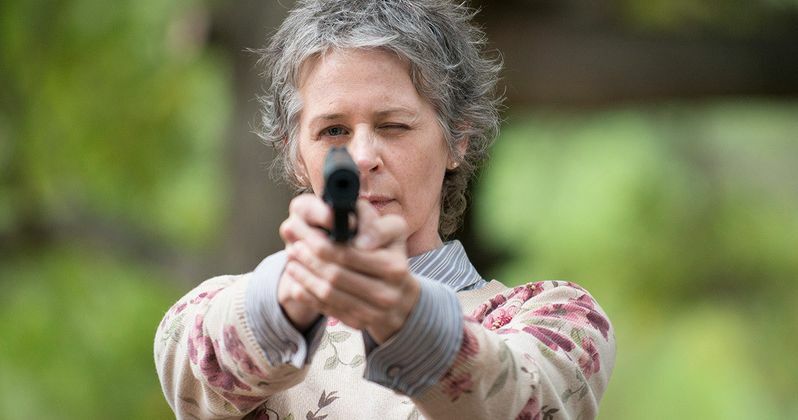 One of the show's stars, Melissa Suzanne McBride, who plays Carol, recently spoke with ComicBook.com, and while she wouldn't delve into any specifics about the finale, she did say it was dark and shocking. "It was so very dark. I couldn't say anything after I had finished reading it. I felt like I had dropped into a blackhole." Last week, AMC released the plot synopses for the last three episodes, which teased that there may actually be two major deaths coming in the final episodes. In the 98th issue of the comic, both Abraham and Eugene (Josh McDermitt) leave Alexandria on a secret mission, when, out of nowhere, an arrow strikes Abraham in the head, killing him instantly. Eugene tries to run back to Alexandria, but he is captured by a group of Saviors lead by a man named Dwight. The plot synopsis for the finale teased that it's set "in the aftermath of a tragic blow," which could be Abraham's death. The plot details for Something to Fear teased a "brutal lesson" that Rick and his group will learn, which most likely is the death of Glenn. In the comics, /walking-dead-negan-best-villain-ever/Negan (Jeffrey Dean Morgan) chose Glenn at random to kill, to send a message to the Alexandrians. The episode's title, Something to Fear, is taken directly from the title of the six-issue comics volume, which spans issues 97 through 102. Of course, the show has deviated from the comics in the past, so it's completely possible that both Glenn and Abraham will live to see another day in The Walking Dead Season 7. But if they do, Eugene may not make it out of this mess alive. During last week's episode, Not Tomorrow Yet, Rick (Andrew Lincoln) lead a large group of Alexandrians and a handful of people from the Hilltop Colony on an attack at the Saviors' compound. These survivors went in and killed a slew of Saviors while they slept. But one managed to sound an alarm, leading to a deadly shootout. By the next morning, it appeared that Rick's crew had killed everyone in this compound. As they began to leave for home, one remaining Savior attempted to escape on motorcycle. But he was captured right before a mysterious voice over a walkie-talkie revealed that Maggie and Carol had been taken hostage. Find out what happens during tonight's episode, The Same Boat, airing at 9 PM ET on AMC.